Osmosis: Hydration. (2019, April 20). Retrieved from (https://www.osmosis.org/learn/Hydration). 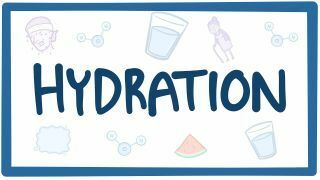 Dehydration refers to a deficit of total body water, with an accompanying disruption of metabolic processes. Dehydration is also a cause for hypernatremia. The term dehydration must be distinguished from hypovolemia (loss of blood volume, particularly plasma). With proper hydration, a persons kidneys produce ml of urine per day.